Leading players in the global extruded plastics market are aiming to cater demand emanating from consumer goods, packaging, and agriculture industries. Doing so they are looking to establish a stronghold in the global market. Transparency Market Research (TMR) in a recent study identifies Sealed Air Corporation, Berry Global Inc., Saudi Basic Industries Corp., Formosa Plastics Corporation, and Sigma Plastics Group as some of the key market participants. Considering the focus towards innovation, TMR expects the research spending by the market players to increase over the coming years. Besides helping the market players expand their footprint worldwide, these strategies are also expected to buoy growth or the global extruded plastics market. Given the prevailing competition, several market players are likely to forge strategic collaborations to forge growth. These strategies are likely to positively influence the overall market. TMR pegged the global extruded plastic market at US$162,240.3 mn in 2016. Rising at a CAGR of 6%, the market is forecast to reach US$271,797.3 mn by the end of 2025. Among key types, the demand for low density polyethylene (LPDE) is expected to rise at a promising pace. LPDE is non-toxic, it has a high molecular weight, and shows impressive break resistance. The increasing awareness offered by LPDE is expected to fuel their demand in the coming years. Regionally, Asia Pacific emerged dominant in the global extruded plastics market in 2016. The increasing use of plastic products and containers will fuel the demand for extruded plastics in the region. As per TMR, automotive and packaging industries emerged as key end users of extruded plastics. Against this backdrop, growth witnessed in these countries will create lucrative growth prospects for the global extruded plastics market. Furthermore, the increasing demand for ready-to-eat food will reassert the dominant stance of the packaging industry. The prevailing market forces are expected to tip scales in favor of the global extruded plastics market. Recent statistics released by international organizations reveals robust growth in automotive production between 2015 and 2016. The globally accelerating vehicle production backed by the increasing demand for vehicles with advanced features will enable growth in the global extruded plastics market. Furthermore, the market is expected to gain considerably from the advent of advanced technologies and the increasing investment in research and development. On the downside, the market will continue reeling under volatile raw material prices. TMR has highlighted this as one of the key factors restricting growth in the global extruded plastics market. Rising raw material prices can push the cost of producing and processing products. This will inevitably surge the prices in which these products are sold, which can have a negative impact on the overall market. A key point to note here is that extruded plastics are obtained from crude oil. Considering this, the high cost and the complex nature of processing often spikes prices of extruded plastics in turn adversely impacting their sales. This, together with stringent regulations implemented across certain nations to curb the use of plastics will restrain the extruded plastics market to an extent. 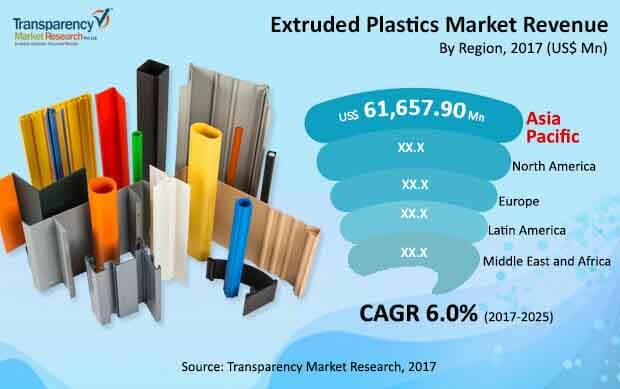 Nonetheless, the rising use of extruded plastics across various sectors will enable the market witness a steady growth through the course of the report’s forecast period.